The more I learn about photography, the more I know that once you’ve found good light you’ve won most of the battle. If you want to hedge your bets on light you go out on the edges of the day– dawn and dusk. If you really want to put some distance between your photos and those captured by your average camera owner, you do what the others won’t do when others won’t do it– go out early and don’t be afraid to get wet, dirty, or both. Sometimes on the weekend, I drag myself (fall) out of bed, put a hat on my tousled hair, grab my camera, memory cards, and batteries and stumble out into the dawn to capture the hell out of …something. What I’ve found on these bleary-eyed excursions is that there are some pretty interesting things going on when most people are just drooling on their pillows. 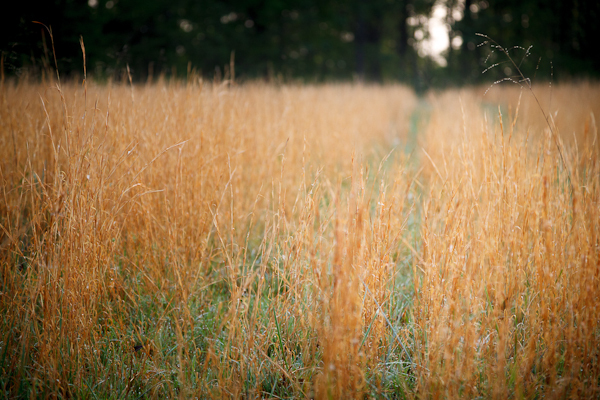 One of my favorite spots for such forays into this dew-soaked world is a small, relatively nondescript field that adjoins our subdivision (that’s it in the photo above– all of the photos in this blog post were taken in this field on a single morning). The first thing I noticed were the dew-enhanced spider webs. You won’t see any photos of them here because these weren’t nice geometrical webs created by orb-weaving spiders. They were relatively amorphous non-picturesque creations brought forth by arachnids from the wrong side of the tracks. Time to move on. The next thing I noticed was a dragonfly airing its wings against the rising sun. When I moved in close and took a few shots I noticed that the dragonfly didn’t budge. Upon viewing the photos later on the computer I saw that the wings were totally coated in dew. No wonder I had a stationary subject– these guys weren’t going anywhere with that heavy burden. When I found the first dragonfly, I opened the aperture to f/4 for the shallow depth of field to isolate the sharp subject from the blurry background. 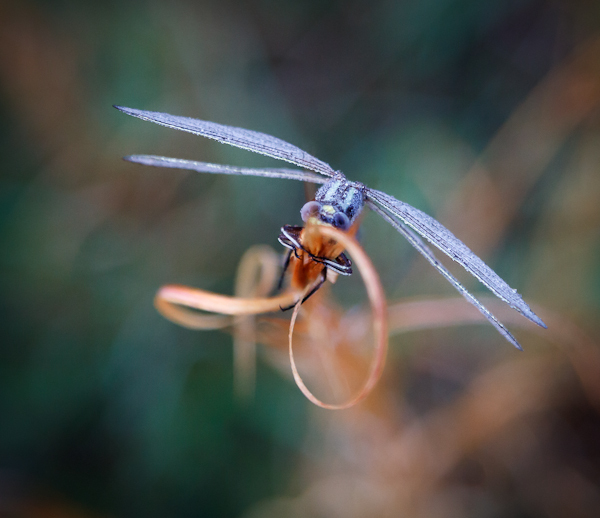 To get on eye level with the dragonfly, I shot from a squat position with the lens focused on the dragonfly (every time I do this I think it’s time to take up yoga so I can maintain a more stable position– really handy when dealing with shallow depth of field). Note the dew droplets on the wings. For the photo above I chose a different point of view. I’ve found that once you locate good light and a subject it’s good to try many different camera angles until you land on one that suits your personal perspective. I like the way the colorful highlights on the legs of this dragonfly match the highlights on the wings and body. 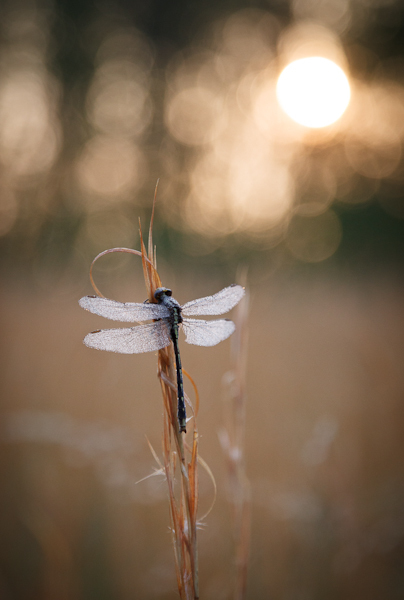 I also like the dark background contrasted with the dragonfly highlighted by the rising sun. All things considered, I was pretty happy with the results of this particular morning shoot. Paid attention to the background. Shot with a wide open aperture (in most cases here I am using f/4) to isolate the subject from the background. Chose a low camera angle on level with the subject. Number one, I should have used a tripod. My shutter speeds were fast enough that I didn’t need one, but if I had I could have shot with a lower ISO for sharper, more noise-free photos. Also, with the camera in a stationary position it would have been much easier to nail the focus exactly where I wanted it (at f/4 the depth of field was inches, at best). 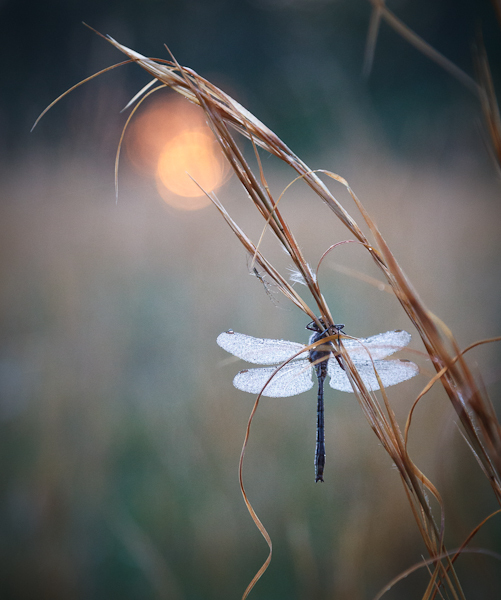 Since the dragonflies weren’t moving, the fastest object in the frame was the rising sun, and I wasn’t focusing on that. With the camera on a tripod, I would have been able to tweak the f-stop to ensure that the entire dragonfly was in focus while maintaining the blurred background. I’m sure there were other steps I could have taken to improve these captures and I will hopefully explore them more fully on the next shoot. If you want your work to stand out, be at a place and time where others don’t go. Capture the unseen from a new point of view. Use your personal perspective to get the photos that only you could see. Feel free to post your own experiences and observations about early morning photography in the comments. This entry was posted in Nature, Photography, Tips.